So, Andy Coulson has been found guilty of plotting to hack phones – but former colleague Rebekah Brooks walked free after the jury in the hacking trial cleared her of all criminal charges. The verdicts mark more than the end of the case which has unfolded at the Old Bailey for the past eight months. They also come at the end of an era in British popular journalism. Not a golden age, certainly, but a distinct period during which tabloid or “red-top” journalism walked tall, looking down on more serious newspapers and their scruples. For the past half century, the mass-selling papers with red mastheads (or logos) had defied the logic of media history and swaggered at the centre of the stage. That they reached this position at all was something of a miracle achieved against logic and the odds. The coming of television in the 1950s changed the landscape of news media, but not in the way that most predictions expected. Newspapers were not put out of business by television news, just as they had not been abolished by radio in the 1920s. But all the same, broadcasting undermined the foundations on which popular print journalism had been built. Papers cheap enough to be afforded by millions had been published in Britain since the late 19th century. They were irreverent, snappy and noisy, drawing much of their inspiration and style both from working-class Sunday papers devoted to crime and sensation and from (then) brasher American papers. But at the start of the 20th century, British popular papers carried plenty of politics and social commentary alongside. They scorned long-winded writing and established pieties and did so with relish. T P O’Connor, editor of the swashbuckling Star (founded in 1888), once casually dismissed one of the major events in the political calendar as “the few dozen lines of drivel known as the Queen’s Speech”. But by the start of the 21st century, that mixture of silly and serious no longer worked. First radio and then television began a long, gradual process of cramping the style of popular papers. They could no longer mix education and entertainment delivered with brio: they could only entertain. By the time phone-hacking was rife ten years ago, truly investigative stories were unusual. But they still had huge circulations, which promised profits if only publishers and editors could colonise new parts of the market which broadcasters could not reach. Politicians still paid court to titles with readerships in the millions and cared about which way they spun coverage of politics. Cosy relationships with politicians of all parties left editors, particularly of Rupert Murdoch’s London popular papers, feeling that they were invulnerable. Not true – but who cared? 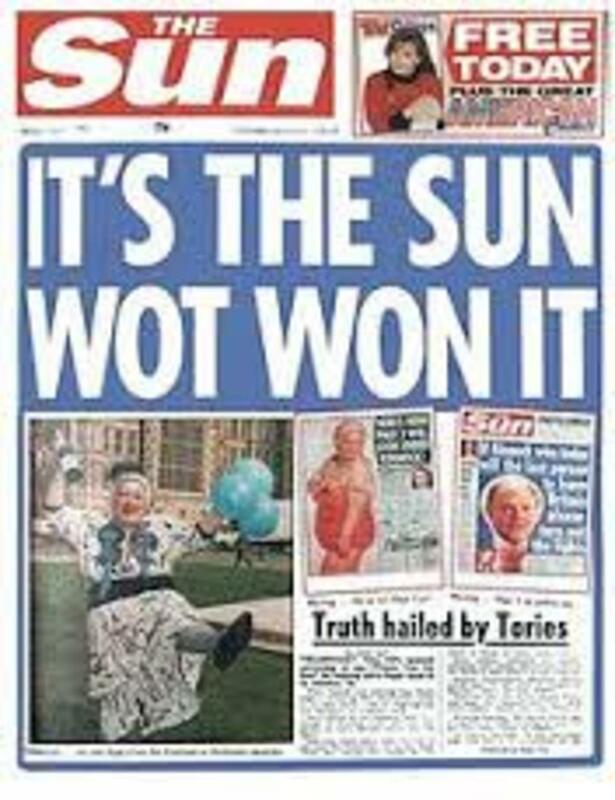 “It was The Sun Wot Won It” was an arrogantly arresting headline after the unexpected Conservative victory in the General Election of 1992. The fact that the claim was almost certainly wrong did not stop a lot of people believing it. The diaries of Piers Morgan, made editor of the News of the World at the age of 28 and later editor of the Daily Mirror, are an entertaining string of encounters with deferential politicians and trivial disclosures with occasionally life-wrecking consequences. The high point of the Daily Mirror’s circulation had been 1966; Morgan was sacked for presiding over the publication of faked pictures of British soldiers abusing Iraqi prisoners. The state of the popular papers was laid bare by the long Leveson report after the inquiry into phone-hacking. By the time the report was published in 2012, there were three separate Scotland Yard inquiries into phone interception, computer hacking and bribery of civil servants. The trial just ended is the largest case brought after those inquiries but it is not the only one; others are still to come. That was not the only pressure on the business of popular papers. By the 1990s, circulations were declining slowly but steadily. Advertising revenue remained healthy, but long-term prospects were poor. It was not obvious – and still isn’t today – how the popular paper formulas could take advantage of online publishing. There was plenty of demand for gossip, but the market was being won by agile digital natives with sites like Gawker in the US or Popbitch in Britain. Celebrity scandal had become a specialised business in which journalists operated as traders in a market for revelation and editors negotiated obstacle courses erected by equally specialised lawyers engaged to protect the reputation of their clients. As markets usually do, a new breed of brokers and middlemen emerged to make sure that supply and demand were matched. As privacy laws tightened around the world over the last 15 years, these stories became riskier. Max Clifford was the acknowledged king of “kiss-and-tell”. If you had slept with someone famous, or even slightly well-known, and you wanted to make money, you told Max Clifford. Clifford, on first name terms with editors and celebrities, well-known for his charity work, would cut a deal. But Clifford had another life. As controversies still swirl around the failure to prevent sexual abuse of children by the celebrity disc jockey Jimmy Saville, the 71-year-old Clifford was convicted in April of eight indecent assaults on girls as young as 15. He was sentenced to eight years in jail. The abrupt closure of the News of the World by Rupert Murdoch in 2011 when the phone-hacking scandal turned into a storm opened the last act of the drama which saw a small group of once-potent papers stripped of most of their power. This does not mean that demand for celebrity gossip has gone, merely that it is being supplied by other sources. The internet has brought back tabloid sensibility to the American news media: it’s not being done by newspapers but by a new generation of snarky, revelatory and unashamedly trashy websites. “Tabloid” stories will be with us as long as there is human curiosity about other peoples’ private lives. But the British “tabloids” have had their day. George Brock worked for The Times, owned by News International, 1981-2009.